Why NCTO matters more than ever. The U.S. textile industry is experiencing an exciting and dynamic period. A new policy environment has evolved in Washington that places a greater emphasis on domestic manufacturing. Combined with a desire for shortening production and sourcing cycles, investment in U.S. textile production capacity, including foreign direct investment, has been invigorated, as many look to our shores to grow their capacities. I have seen this investment story firsthand. The company for which I have the privilege of serving as CEO, Buhler Quality Yarns, was launched in 1996 by Hermann Bühler AG, a Switzerland-based textile manufacturer originally founded in 1812. This 200-plus-year-history added a fresh chapter when it was purchased by Korea-based Samil Spinning. 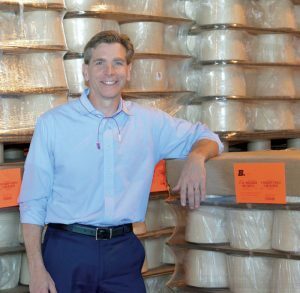 Our new ownership represents a sea-change — Samil Spinning has invested in Buhler Quality Yarns for growth — they see clear benefits and great potential in Western Hemisphere production. This is not just a single data point to exemplify a trend. Consider a recently published McKinsey study1 demonstrating that apparel manufacturing is returning to our hemisphere in a way thought impossible only a few short years ago. Retail, in almost all sectors, stresses the need for speed-to-market manufacturing processes, underscoring the need for optimized and more local supply chains. Opportunity is potential, and potential is full of as much uncertainty as it is excitement. Let’s make no mistake — we are in uncharted territory. Growth is certainly welcome news, but prosperity can often be guided by nearsighted intentions, causing us to be the architects of unintended consequences further down the road. This is why our industry needs the National Council of Textile Organizations (NCTO) now more than ever. Our core mission, to “preserve and enable the prosperous future of U.S. textile manufacturing,” is being put to the test under new light. Consider the uncertainty of a potential trade war with China. The U.S. Government recently placed duties on many products under 301 Authority.2 This position has touched many products in the supply chain, affecting many textile companies — some positively, some negatively. Navigating these new constructs, and anticipating next moves by both countries, has become a significant challenge not just for textile companies, but for brands and retailers as well. In addition, the Trump administration has renegotiated the North American Free Trade Agreement (NAFTA), America’s regional free trade agreement with Canada and Mexico. Since U.S. textile exports to the combined Mexican and Canadian markets totaled nearly $12 billion in 2017, it is critical that any transition to the U.S.-Canada-Mexico Agreement (USMCA) be smooth for all parties. Many brands and retailers are now faced with the decision to either maintain their current sourcing strategies, or adopt — or in many cases, create — new strategies that feature Western Hemisphere sourcing. Trade challenges factor heavily, but it is also critical for brands and retailers to recognize the need to contract sourcing lead times and to avoid supply disruption. David Sasso — vice president of Sales at Buhler Quality Yarns, and a veteran expert in textile supply chains — has made a very strong argument for Western Hemisphere sourcing in two recent articles. In “Responsive Retail”3 and “What TPP’s Death Means for U.S. Apparel Brands and Supply Chain Management in Uncertain Times”4 he argues that, because of the trend-based, mercurial nature of the fashion industry, it is important to be able to react quickly. Shotgun approaches to fashion can cause two major issues. First, when an item is ordered in large quantity and sales don’t meet expectations, the result is markdowns and lost revenue. A second possible negative outcome is when an item sells in far greater quantities than anticipated. Supply chains dependent on overseas sources, and shipping constraints often lead to stockouts, leaving profits on the table and customers looking elsewhere for similar styles. A brand’s sourcing strategy that moves at least a portion of its sourcing chain to the Western Hemisphere reduces lead times, solving both issues. A Western Hemisphere supply chain holds net-positive potential for brands, retailers, and consumers alike. The United States and our partners in the Western Hemisphere supply chain are making investments to better serve brands and retailers — and ultimately, consumers. Strategic business partnerships are important, but they must also be combined with a strong voice in Washington to ensure that the investments and relationships are allowed to prosper. This is a strategy that must be recognized and championed — and that is exactly why NCTO exists. We must ensure that those working to craft trade and procurement policies hear our voice, understand our challenges, foresee those policy decisions that may have net-negative consequences for our industry, and enact policy engineered to further our interests. Governmental policy makers are not textile supply chain experts who live and breathe this industry. We are, and thus only we, as a united industry, can communicate our interests. I am proud to serve this industry as chairman of the NCTO, and proud to work with and on behalf of all of our members. The opportunity is ours to seize. It is a truly exciting time to be in American textiles. Editor’s Notes: NCTO Chairman Marty Moran has been part of U.S. textile manufacturing for more than 26 years. A native of North Carolina, he serves as CEO of Jefferson, Ga.-based Buhler Quality Yarns Corp. (a Samil Spinning Co.). Buhler is known not only for its high-quality yarn spinning, but also for its deep supply chain expertise, placing Moran at the center of this complex and ever-shifting industry. This article appears in Textile World courtesy of the National Council of Textile Organizations (NCTO) as part of the “American Textiles: We Make Amazing™” campaign. NCTO is a trade association representing U.S. textile manufacturing. Please visit ncto.org to learn more about NCTO, the industry and the campaign.